It’s no surprise that MOO loves paper—we built an entire business around it. But our love of premium quality paper stems not just from the paper itself, but from the craft, passion, and innovation behind it. Which is why MOO shares so many values with our collaborator and supplier, Mohawk Fine Papers. The historic paper mill located in upstate New York has been crafting fine papers for nearly a century. Over the years, MOO and Mohawk have built a strong collaborative partnership to bring customers the finest premium quality papers paired with the new and unique digital printing technology. The result? Luxe: our thickest, most premium and colorful paper option that goes far beyond first impressions. We spoke to Mohawk’s VP Creative Director, Chris Harrold, about the origins of Luxe and how the company uses it for their own cards. When was Mohawk founded and where is it located? There are two mill sites, located in Cohoes and Waterford, New York, where the Mohawk River meets the Hudson River. The name of our company is taken from the river where we draw water from. It was started by George O’Connor in 1931, who took the mill over in receivership during the Great Depression. How did the partnership between MOO and Mohawk come about? We first heard about MOO from one of our partners GF Smith in London who distributes our paper. They had mentioned MOO and said that there might be some opportunities for product collaboration, since we are a heritage paper company and MOO was a digital printing innovator who appreciated paper. When we first met with MOO, we immediately “got” each other—we both appreciate and love design, as well as paper and print. Mohawk—by our very nature—is all about paper and print, and we came together based on our mutual love of beautiful things. What we really fell in love with about MOO was its appetite to explore and invent—these are our common DNA strands. Those initial meetings were all about how we could make this an even more high-impact experience. Ultimately, this led to the development of Luxe paper 6 years ago. We started asking ourselves what we could do to make a really thick card that emulates traditional high-end, heavy-stock business cards. The idea would leverage both of our strengths—MOO’s commitment to Printfinity and premium quality, and our ability to make fine traditional materials in our own innovative way by putting colored and white paper together. The result was the Luxe line, a true product breakthrough for both MOO and Mohawk. That’s the hallmark of our relationship—we each recognize what the other does really well and respects that, and brings those skills and insights to the table and invent new products. Could you talk about Luxe paper and its prominent features? Mohawk Superfine is arguably the most well recognized product in our portfolio. It was introduced in 1946 and is recognized globally as our flagship paper. It’s a product within the paper world that has withstood the test of time. Why is that? Well, it’s emblematic of our craftsmanship and our attention to detail. It defines fine paper. It is also our most widely recognized paper and was used in everything from corporate identity collateral to Madonna’s photo book in the ‘80s. That’s why it seemed obvious to settle on Superfine when MOO was interested in elevating the Business Card. The innovation was born out of using a really well known and established material—Mohawk Superfine paper—and pairing it with MOO’s printing technology. The resulting product was something that nobody had ever seen before and also defied logic. 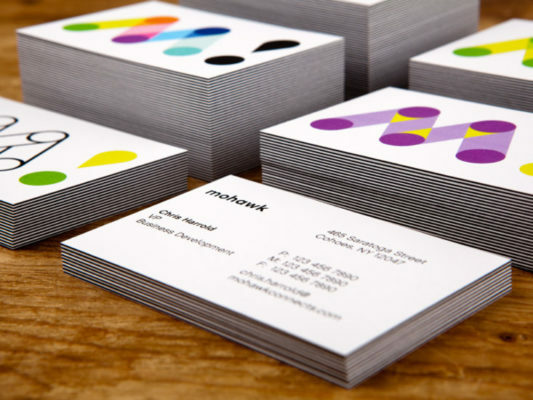 We were taking advantage of our manufacturing expertise, MOO’s printing expertise, and looking at how we could get a layer of color in the middle that emulates edge painting on business cards—which is the hallmark of high-end business cards. It also allows the customer to take advantage of building their own cards in a digital workflow and get them quickly after ordering. What kinds of companies go with Luxe over other papers? How do you think presentation reflects what kind of brand you are? We are living in a digital-first world. As a result, object quality is taking a new role of importance for consumers—like film photography, notebooks, and vinyl. People treasure the realness of objects and artifacts. Analog is in. In terms of paper—and more specifically, Business Cards—MOO founder Richard Moross really hit on something by starting the company around the indispensable interaction between people in business handing a Business Card to someone. It is where artifact and ceremony intersect. A product like Luxe is invariably, without a doubt, a total conversation starter. When I hand out my Mohawk Business Card, it usually creates a kind of “business card envy.” People comment on how beautiful the cards are, and always lament the quality of their own cards. It is a powerful reaction to have at the start of a business interaction. That exchange—where you invite someone to contact you—is bolstered by the quality of the object I’m handing you. It really telegraphs something about who Mohawk is as a company. The cards are thick and they have physicality. The thickness infers something—that you care about quality and details. Mohawk is also a MOO Business Services customer. How do you use Luxe and Business Cards for your business? Want to get Luxe for your team? Fill out the form below to get more information on MOO Business Services.